In the hustle and bustle of a busy exhibition hall, it can seem difficult to know how your brand is going to stand out. Here are 4 ways you can make sure that you stand out above your competitors. The backdrop and branding of your stand is really important to grab attention. Make it clear who you are by making your brand name large and in the upper third of your display so that it’s seen above heads in a crowd. Choose a colour palate that suits your brand providing a high contrast with any text used and remember to keep text to a minimum –it’s you who should be doing the talking not your display. Use high quality images that are high resolution as well as not being blurry as any errors will be magnified when blown up to the size of a display stand. Engaging an audience using digital tools can help to bring your products and services to life on-stand and can be implemented in a cost-effective manner. Using moving pictures from either slideshows or movies on-stand can really help to capture the eye and provide a ‘fear of missing out’ where people want to know what it’s all about.Choose a screen mount with pop up displays to easily add a screen up to 22” that then looks like it’s floating in front of your display. Use a screen to show your website for more products or services. After all, in such a small exhibition environment it can be hard to portray everything that you do. Focus on a small number of products that you offer to really emphasise why people should visit your stand then use an iPad to show off your extended range to those who are interested.Keep your iPad stand in one secure location to allow people to interact with your stand to find out more information themselves, or guided by your stand staff. Promotional products are great to give away at events and exhibitions, not only to enable brand recall after the event but also to drive them to your stand – if your promotional item is enticing enough! Everybody loves a freebie, so if you’re offering something good, then the likelihood is that it’ll catch the attention of passersby who may want one – just make sure that they aren’t too easy to get hold of without talking to you first! Your display can only do so much for you to captivate your audience. It can help to capture that first glance, but it’s up to your sales team to spot these signs of interest and to bring people on-stand. Think about how you want your team to engage with passersby and the questions they can ask them to pique their interest. It’s best to start off with a simple Yes/No question to assess if they could be a potential customer and then to work toward more open ended answers to help refine their needs so you can suggest potential products or services of interest. 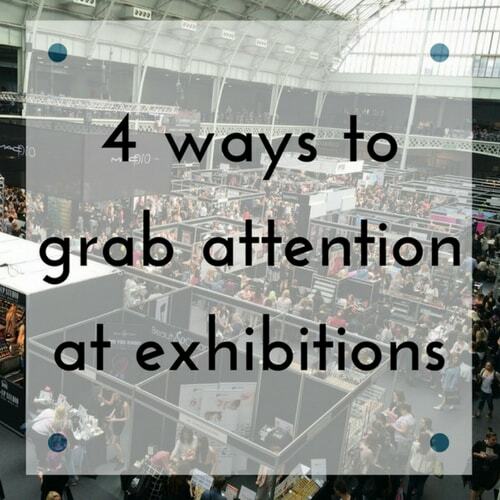 Provide training for your staff so that they are experts on your exhibiting campaign before the event and make sure they arrive early to be prepared the minute the first person walks through the doors.